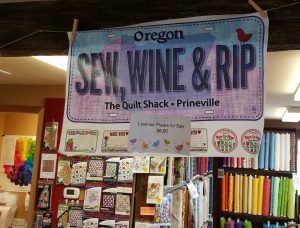 In May, I did a quilting road trip to Northeastern and Central Oregon. 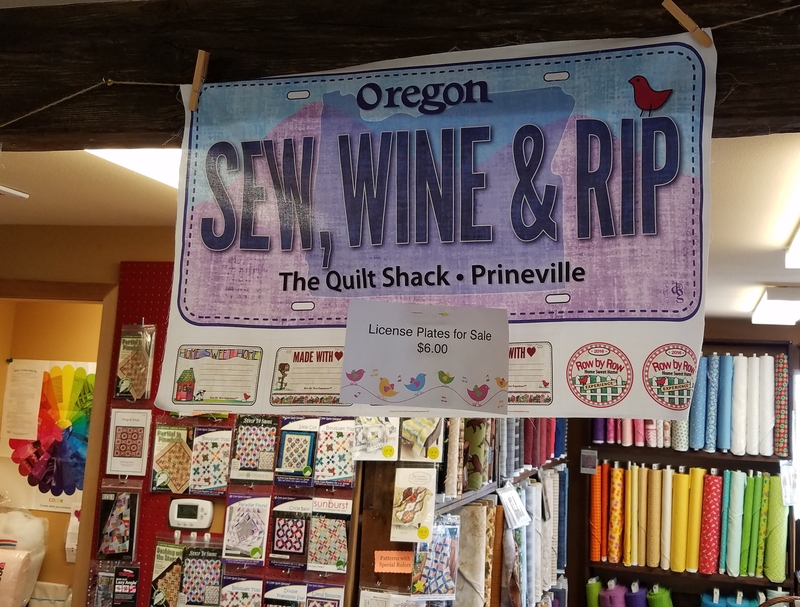 After my time in John Day (see last two posts), I went to Prineville where I taught at the Crook County Quilters’ Guild. 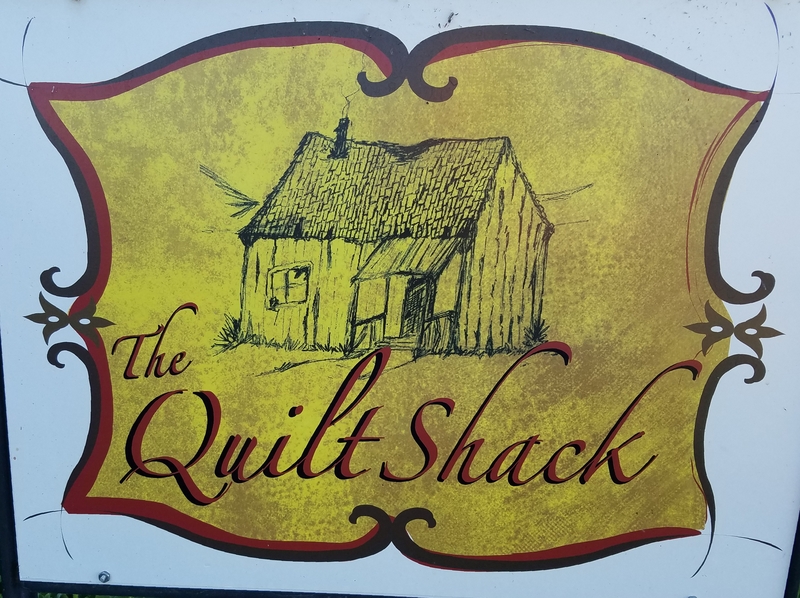 My quilting hostess took me to the local quilt store in town, The Quilt Shack, and I was welcomed warmly by the owner, Rhonda. The store is located at 1211 NW Madras Hwy/Hwy 26. 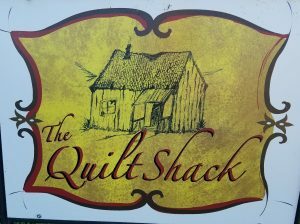 This place has great character both outside and in, and I loved it. 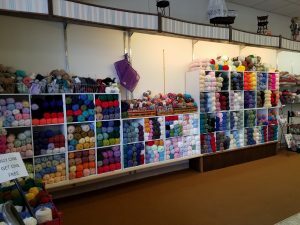 The store is light and has a spacious feeling even though it is quite small. 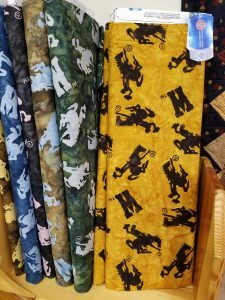 There’s a good selection of monochromatic fabrics as well as several fun novelty prints. 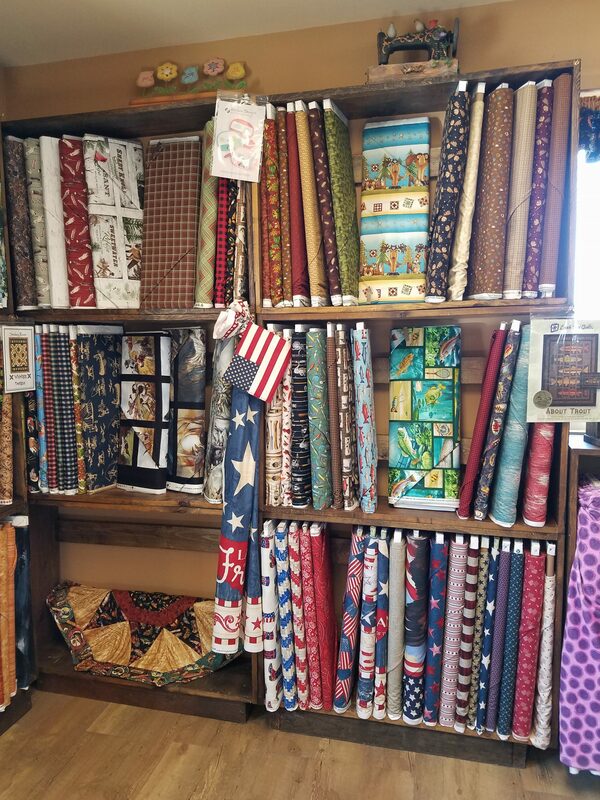 I found the perfect red fabric for my current project. 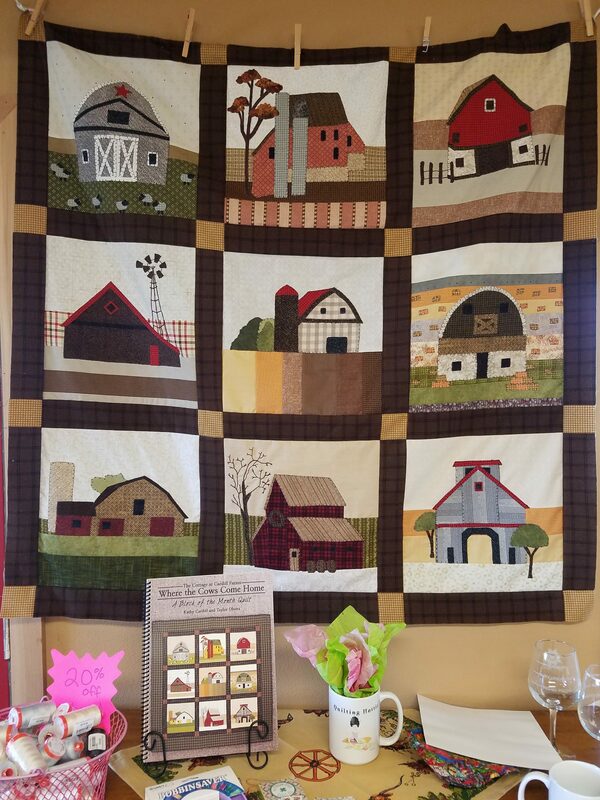 Here’s some new farm themed fabric and a nice barn blocks quilt sample. 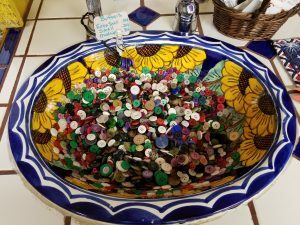 There were some wonderful touches, for example, this pretty basin full of buttons of every color. If you are in Central Oregon, take some time to stop by. 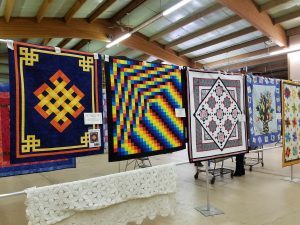 Last week, I posted pictures of my quilts hanging in the John Day quilt show at the Fairgrounds on 19th and 20th May, where I was the featured artist. 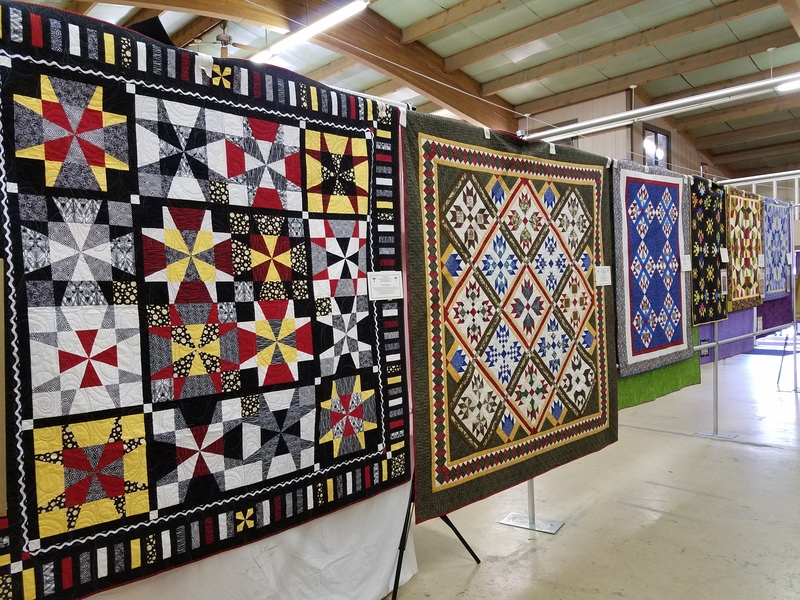 Here is a sampling of some the other quilts in the show made by guild members and locals. 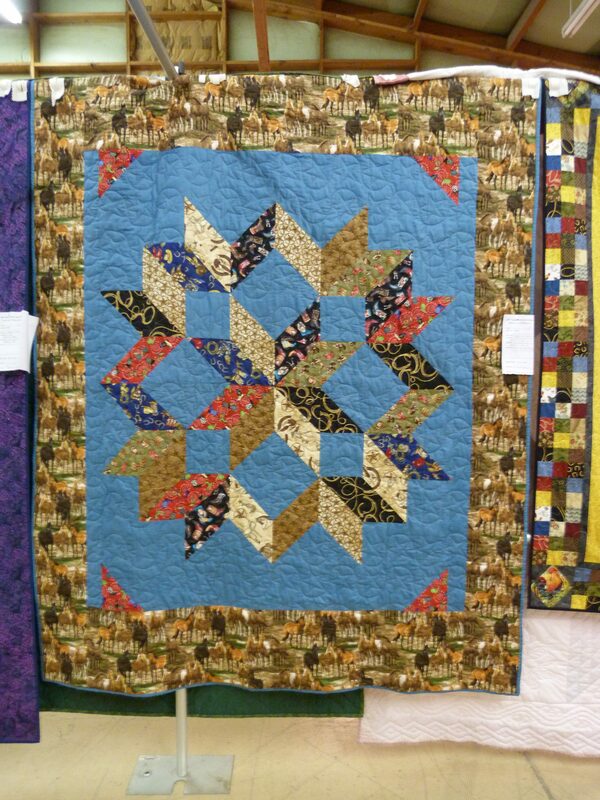 The first is a Carpenter’s Wheel, made by Dotty Parsons and machine quilted by Mary Lou Drury. 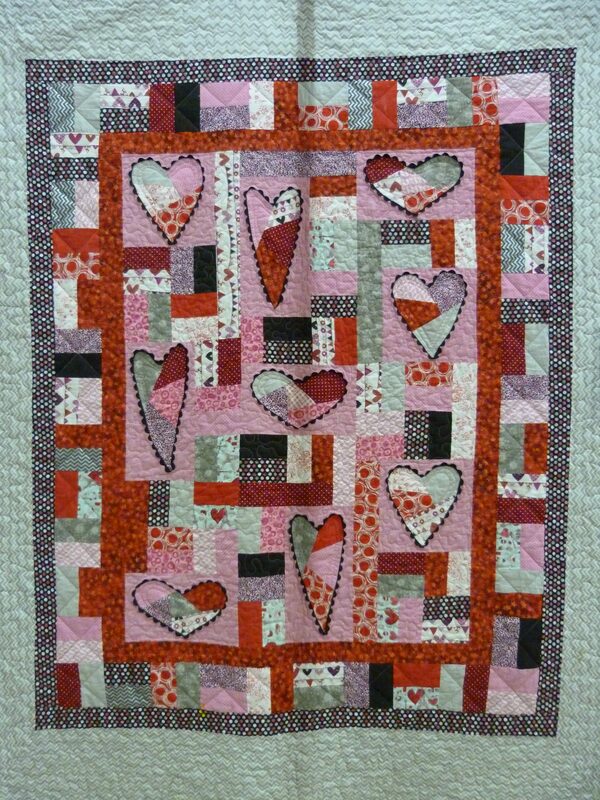 Dotty made this quilt for her grand daughter, Halle. 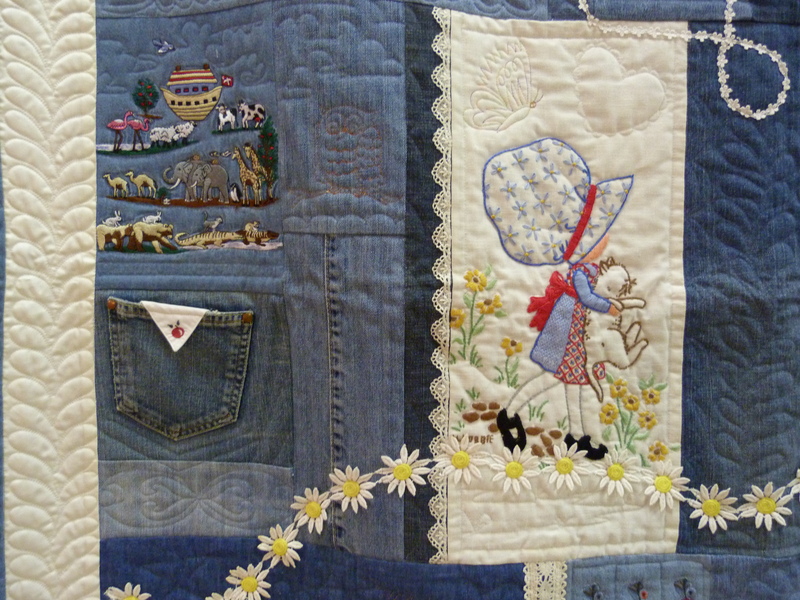 I love the blue background to offset the the horsey, western themed fabrics. The delightful farm quilt was made by Karen Hinton. 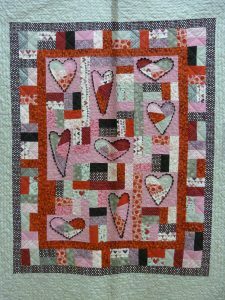 The hearts quilt is another by Dotty Parsons made for her grand daughter, Halle and quilted by Mary Lou Drury. 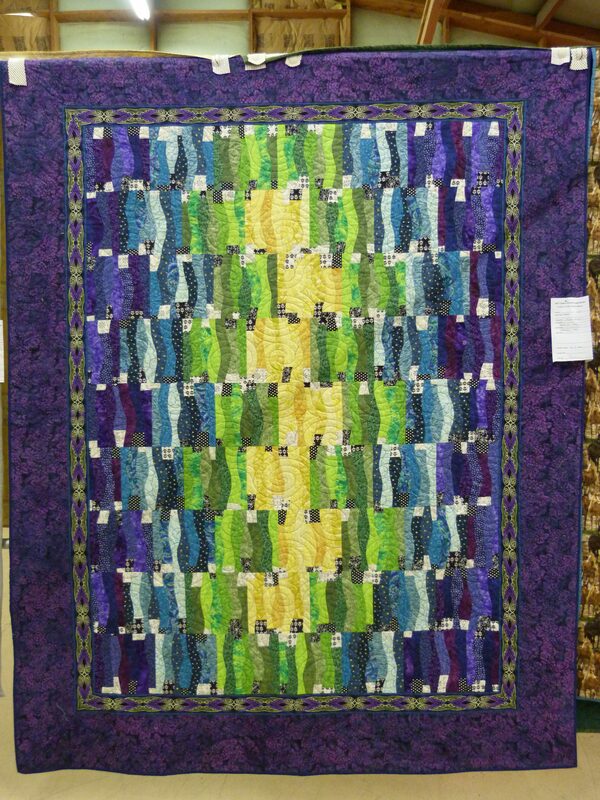 Karen Hinton made this curved strips quilt. 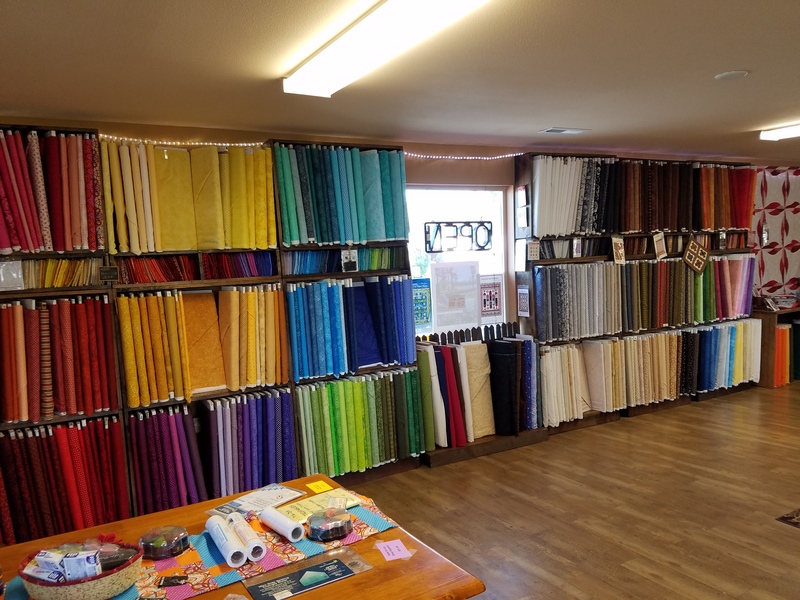 I love her arrangements of the colors and all the different fabrics. 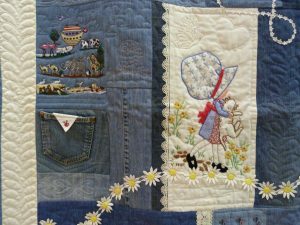 This denim Memory Quilt won the People’s Choice Award. 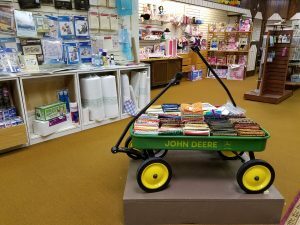 Faith Hundley used materials collected from her relatives. 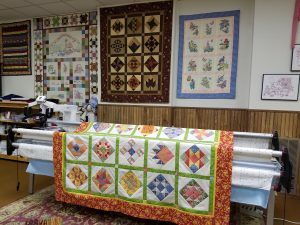 Her Mom, mother-in-law, grandmother, aunts and daughter gave her fabrics, trims and pillow cases. There is white silk from a World War II parachute and fabric from a wedding dress. Faith combined these beautifully and the outstanding machine quilting by Nancy Rowland really enhances this charming quilt. 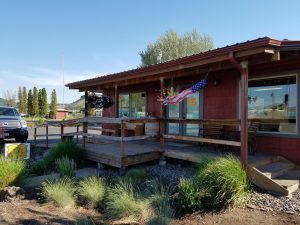 Last month, I drove across the mountains on a long teaching road trip to northeastern and central Oregon. 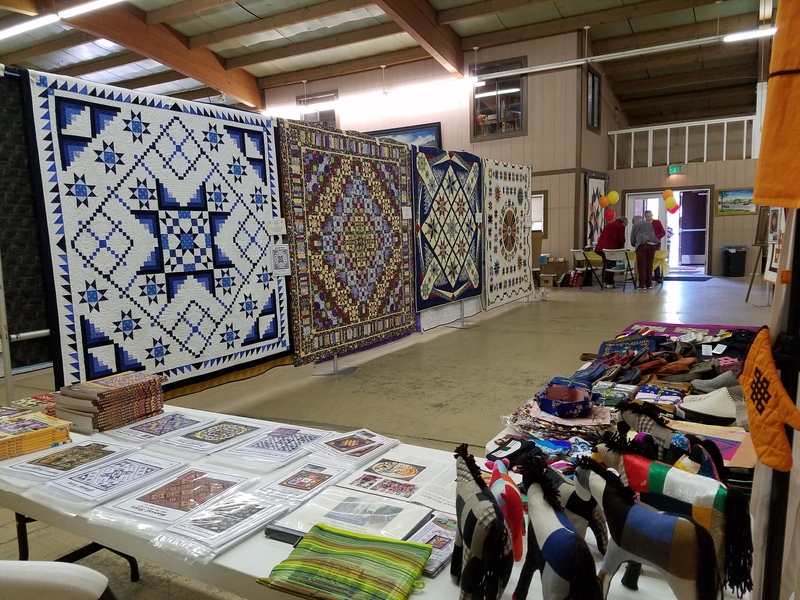 I was invited to be the featured artist at the Grant County Piecemakers’ quilt show in John Day on 19th and 20th May and then taught my Bargello Quilts with Twist workshop there the following day. 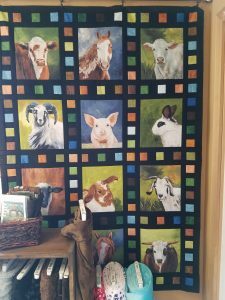 I took about fifteen of my quilts representing my work over the last 20 years, plus an addition 12 Bargello block quilts. Seeing them all hanging together was quite something. 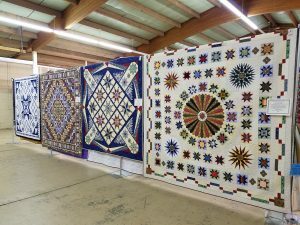 Many of the large quilts stay at home when I travel to teach and even those that travel frequently are never hung altogether, but usually shown one at a time during my lectures. I have to admit to having a, “Wow, did I make all of those!” feeling! 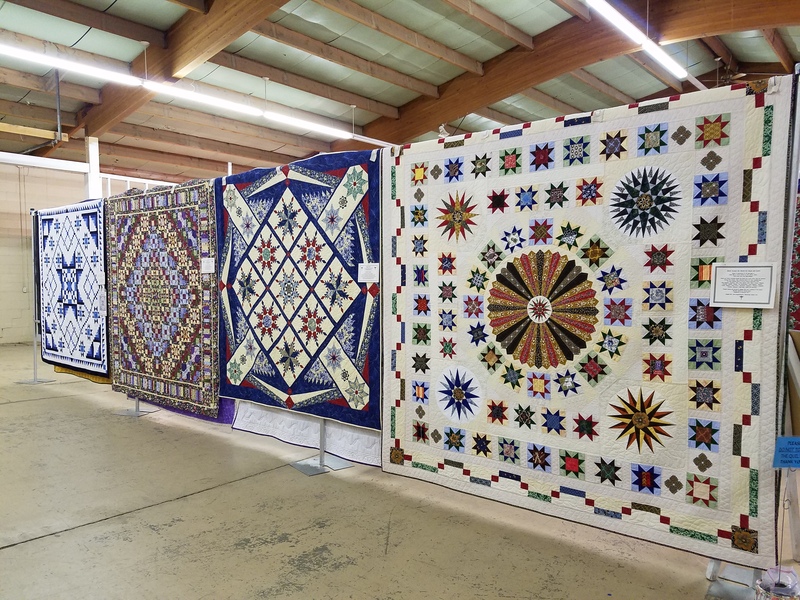 These four are Glacial Stars (the blue and white one), Trip Around the Garden, Celestial Garden and Stars Around the World. I designed Glacial Stars for the 2017 Kitsap Quilters’ Guild raffle and worked with other guild members to piece the quilt top. 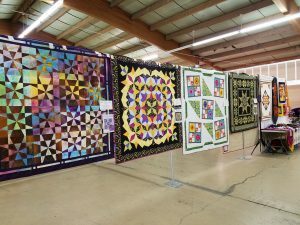 Barbara Seitz, one of our guild members, won the raffle and kindly let me borrow the quilt so that I could display it at the show. 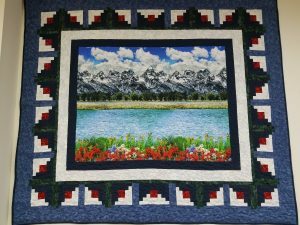 The pattern is available at my on-line store. Trip Around the Garden is featured in my book, Traditional Quilts with a Twist. 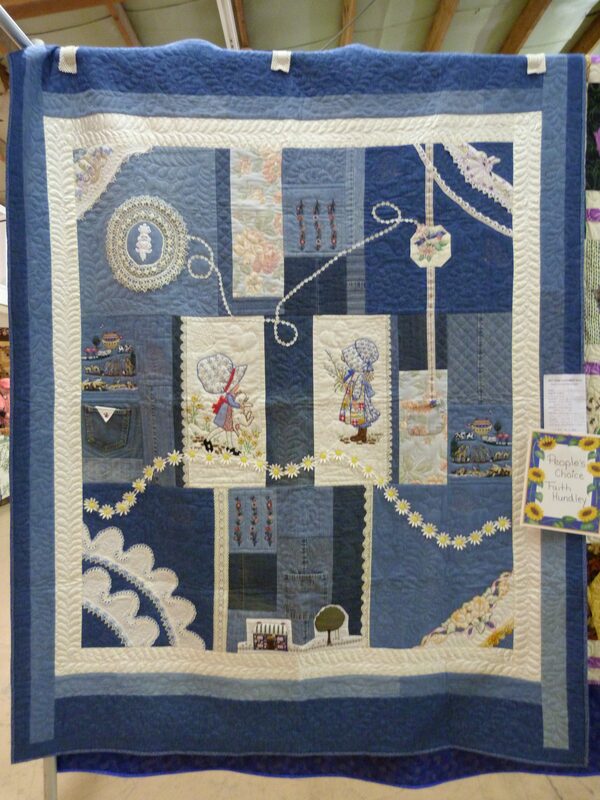 Celestial Garden was a finalist in the 2003 National Quilt Museum’s contest, New Quilts from an Old Favorite: Feathered Star. It placed 5th in that contest and hung in the museum in Paducah for three moths before touring the US for another 18 months. 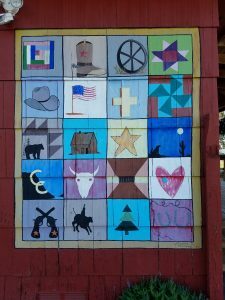 My most recent quilt, Stars Around the World, was made for my daughter and son-in-law using 64 fabrics that they collected from 27 countries on their one-year trip around the world. I displayed several of my template-free Kaleidoscope quilts including the two Op-Art Kaleidoscope quilts on the left of each picture, Retro-Radiation and Tropical Matrix. 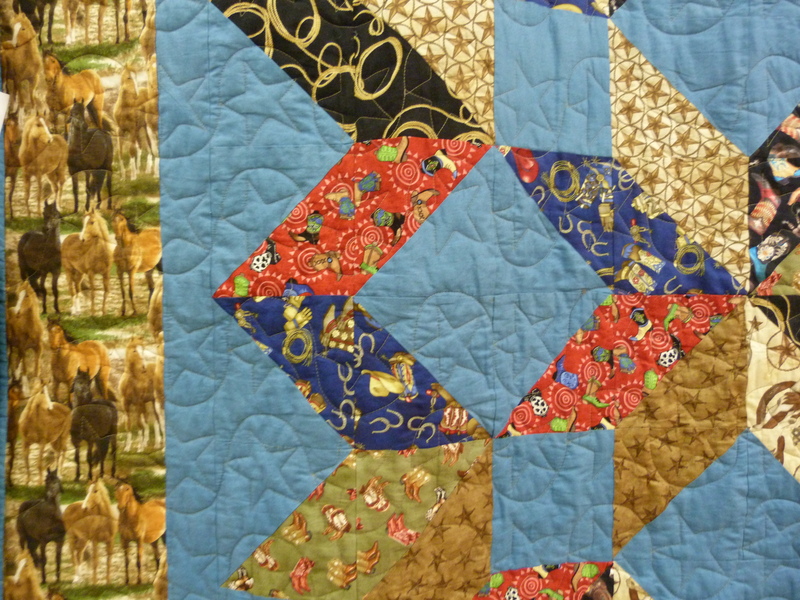 Dragonfly Dance has on-point Kaleidoscope blocks. 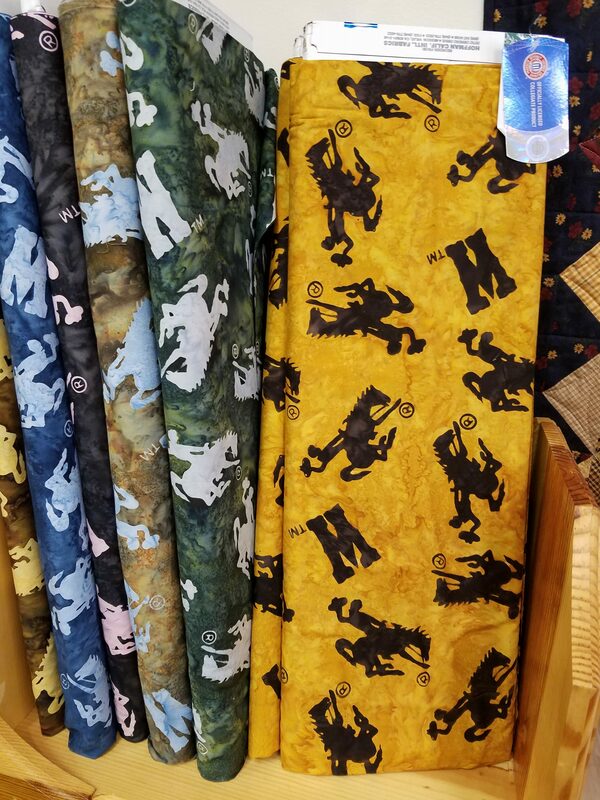 There are three Bear’s Paw variation quilts, all featured in Traditional Quilts with a Twist. The quilt with the large green triangles is my Almost Modern Jacob’s Ladder, a finalist in the 2013 National Quilt Museum contest which also hung in Paducah and traveled around US. 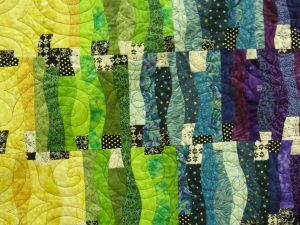 Down at the far end is my black and green Radiant Feathered Star. 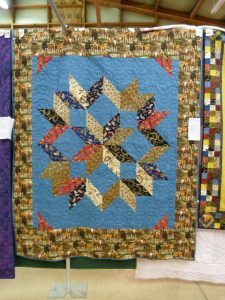 Patterns for the template-free Kaleidoscope quilts and the Feathered Star are available at my on-line store. 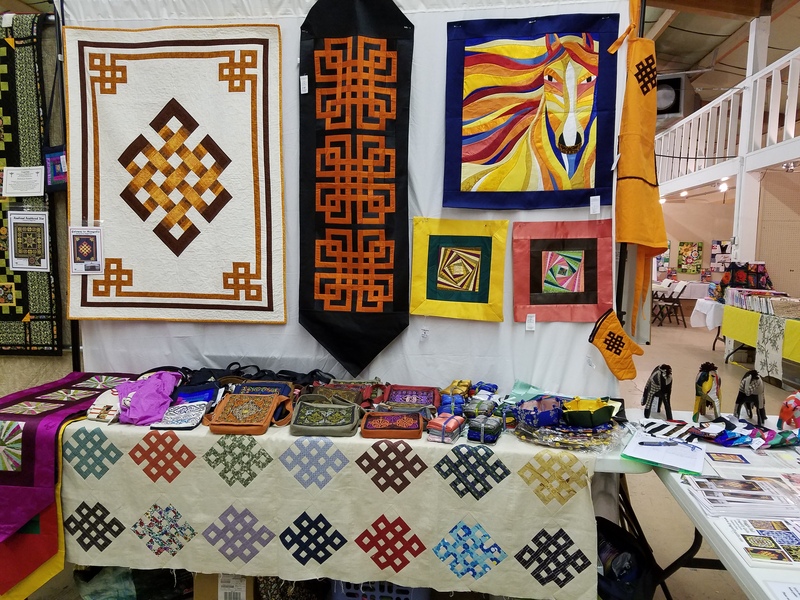 The right picture shows my Mongolia table where I had items for sale to raise funds for the Mongolian Quilting Center. Both pictures include examples of my Gateway to Mongolia design (pattern available) which is one the most popular classes that I teach. 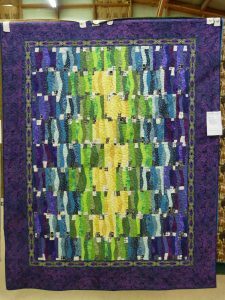 The Woven Rainbow is a relatively recent piece and I’d like to experiment more with this idea. 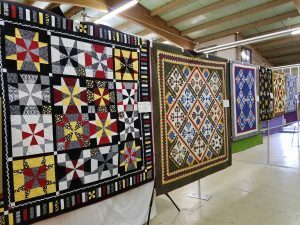 The black, white and red quilt is my Original Octangles in which a large print is featured in an octangle surrounded by triangles. 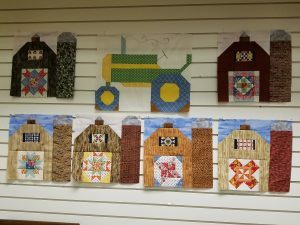 Further down the row is the tree quilt made First Graders at Blakely Elementary School, with hands for the leaves of the tree and woodland animals drawn in the borders. 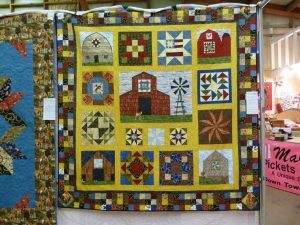 This quilt is featured in my first book, Creative Quilting with Kids. I had a large class with 18 students the day after the show in the same hall at the Fairgrounds. 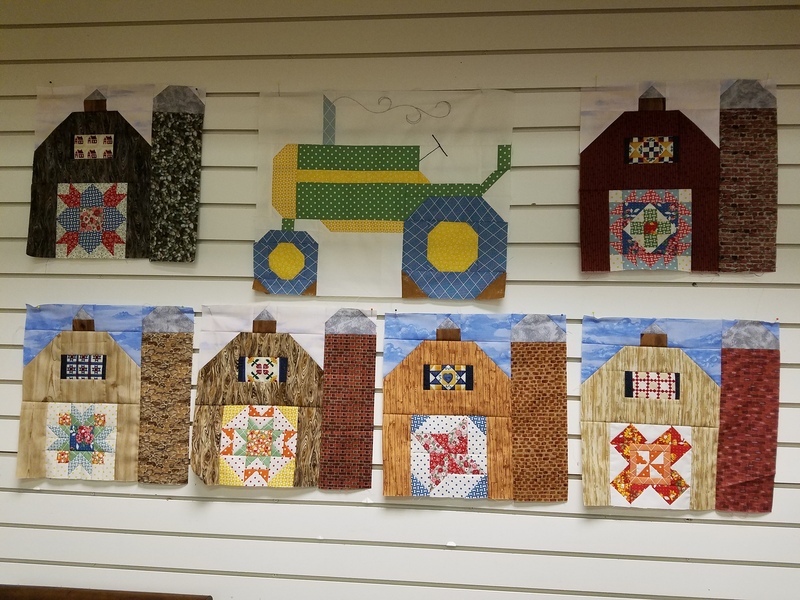 We left all the Bargello block quilts hanging to inspire my students. 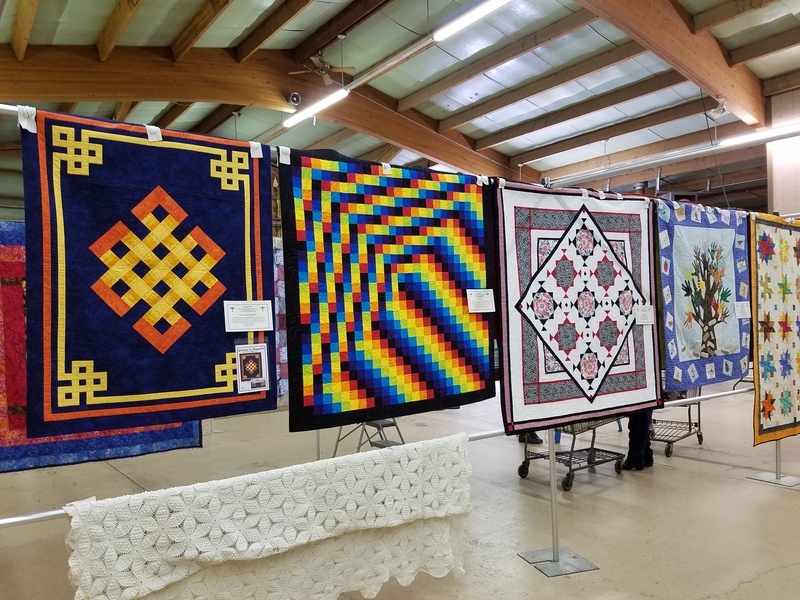 These are all featured in my book, Bargello Quilts with a Twist (available for mail order at my on-line store). 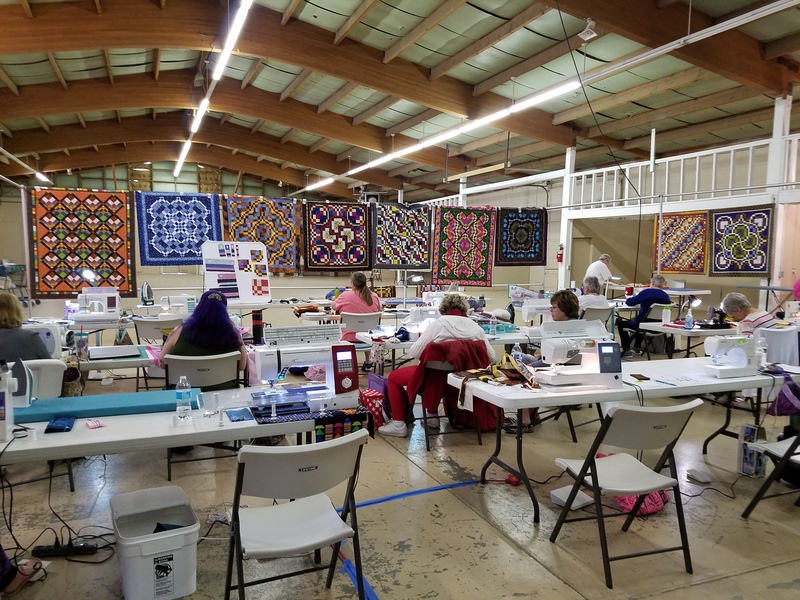 In April, I taught in Torrington, WY at the Goshen County Quilters. 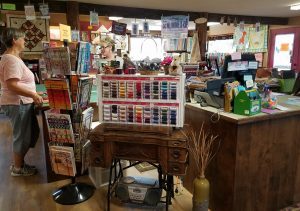 Torrington is a small farming community close to the NE border. 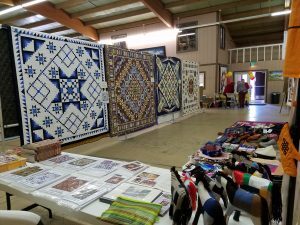 The population is less than 6,000, but they have a vibrant quilting group. 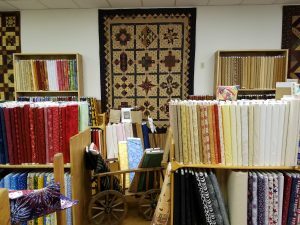 Their local quilt store closed a couple of years ago and became a doll shop. 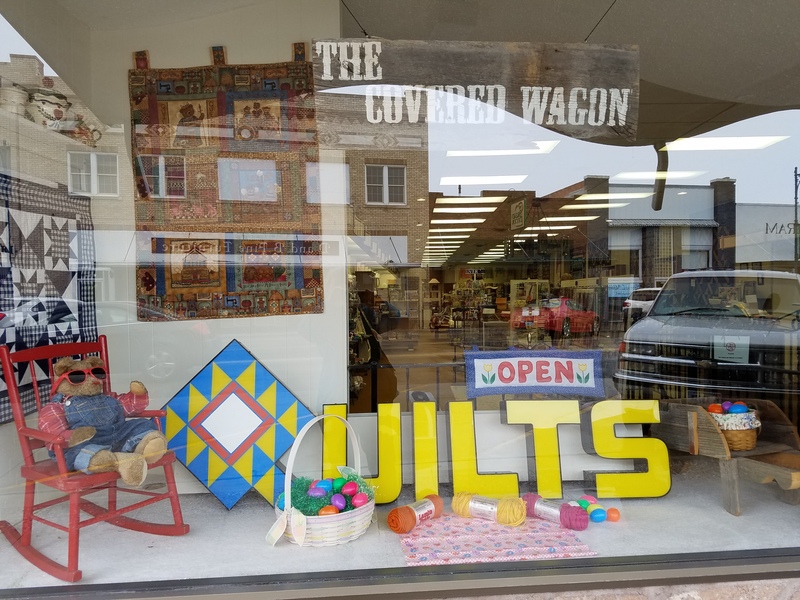 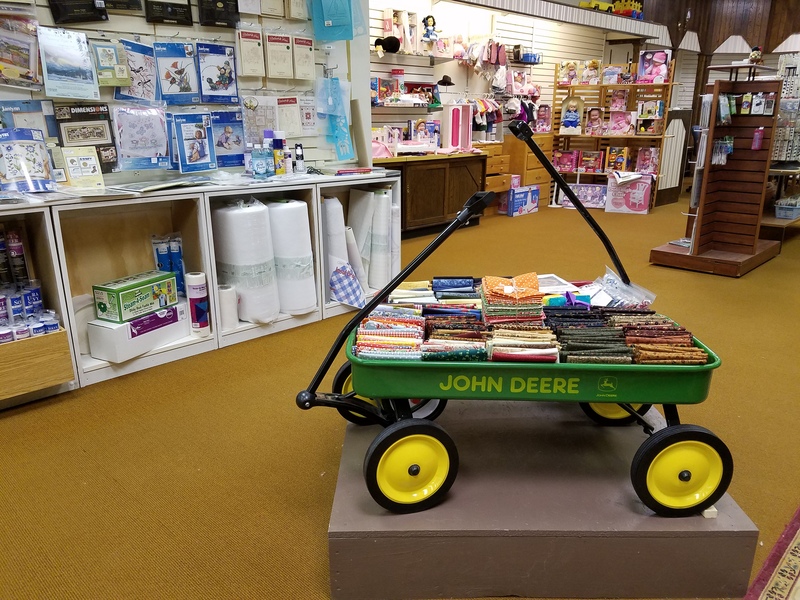 Recently a quilter purchased the store, The Covered Wagon, and is bringing back the quilting supplies. 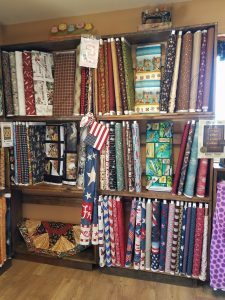 She is gradually expanding the quilting inventory as well as continuing to sell the remaining dolls and a whole variety of craft items from yarn to dressmaking and embroidery. There is a long-arm quilting machine and a selection of fabric (more arriving soon). 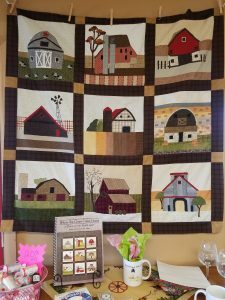 I loved these barn quilt blocks and the tractor. 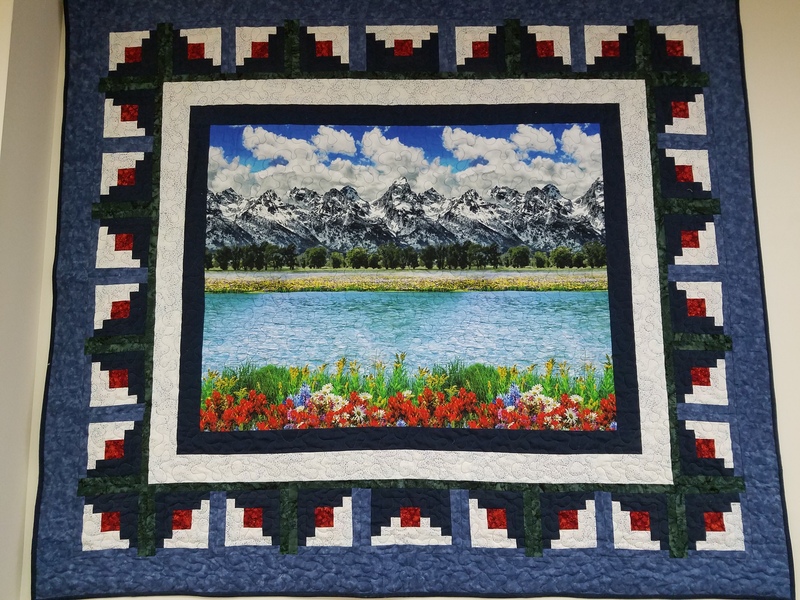 The specialty Wyoming fabrics include this digitally printed panel based on the Grand Tetons Mountains. The next nearest quilt shop is some distance away, so this store is much appreciated by the locals.